Do you know that there’s more to Barbering than just haircuts? The Barbering program prepares individuals to combine their love for style and looking sharp with the technical skills required to be a trusted barber. Students learn to shave and trim hair and beards, cut and dress hair, fit hairpieces, give facial and scalp massages, apply skin treatments, and to prepare for licensure as professional barbers. Because working as a barber is a business, students also learn equipment operation, health and safety, customer service and shop business practices. Unique to this program, students also receive instruction in providing services to chronically ill and special needs clients. To adequately prepare students for employment in this industry, these programs adhere to all ethical and professionals standards of the industry as mandated by the PA State Board of Barber Examinations. Under the supervision of a licensed and credentialed instructor, students participate in the operation of a school-based barbershop, and cater to real clients to gain the customer service and management skills required to become qualified professionals in the industry. 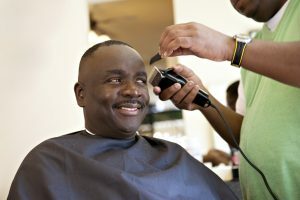 In addition, students intern in barbershops to gain valuable on-the-job training and experience. Instruction is designed to qualify students for the PA State Board of Barber Examiners licensing examination.